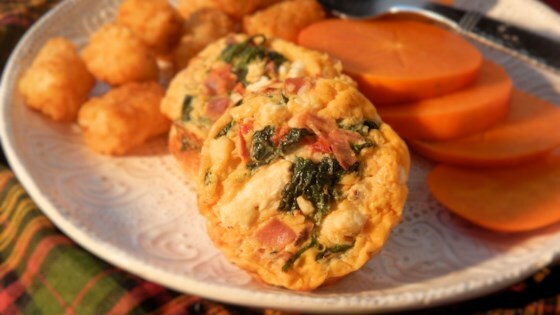 "This is a quick and healthy breakfast option that you can make in advance and freeze. Simply reheat on your way out the door in the morning. These freeze well and can be reheated at anytime." Preheat oven to 400 degrees F (200 degrees C). Spray 12 muffin cups with cooking spray or line with paper liners. Combine eggs, spinach, red bell pepper, ham, egg whites, feta cheese, water, salt, and pepper in a large bowl. Ladle egg mixture into the prepared muffin cups. Bake in the preheated oven until set in the middle, 20 to 25 minutes. This is fuss-free food at its finest. This is soooo easy. Used different cheese. Changed up meat. So yummy. Very good! I used fresh spinach rather than frozen,but otherwise followed recipe as suggested!